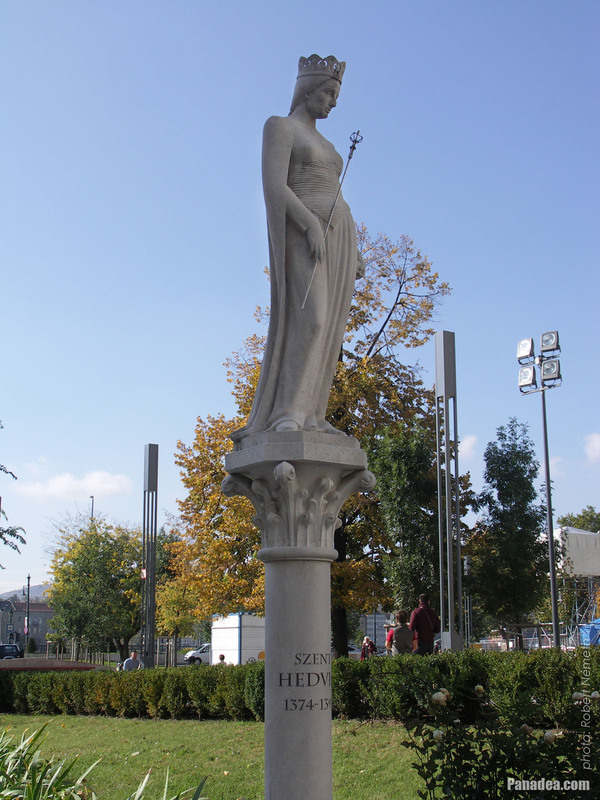 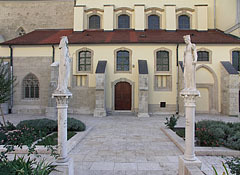 Both statues were created by Dávid Tóth, the former one in 2002 and the latter in 2009. 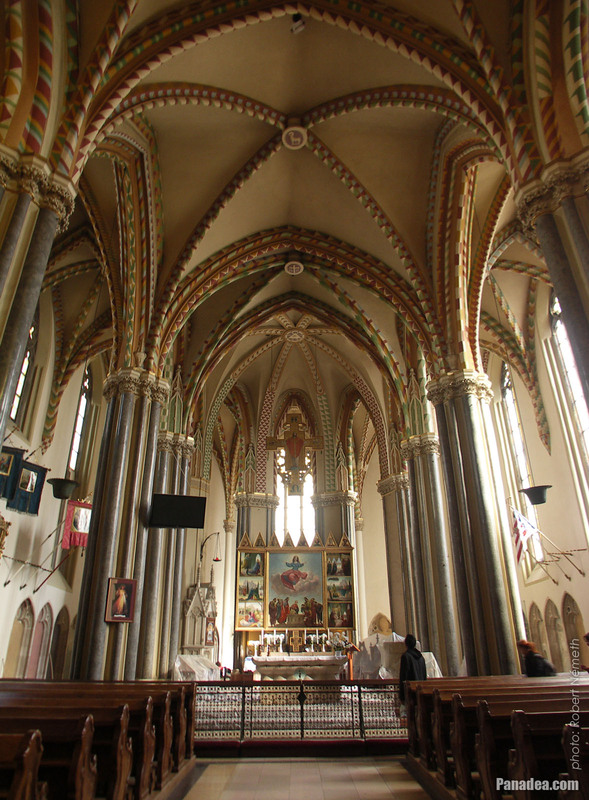 The emphatic colored paintings on the vaults of the Inner City Parish Church were created by Imre Steindl in 1889. 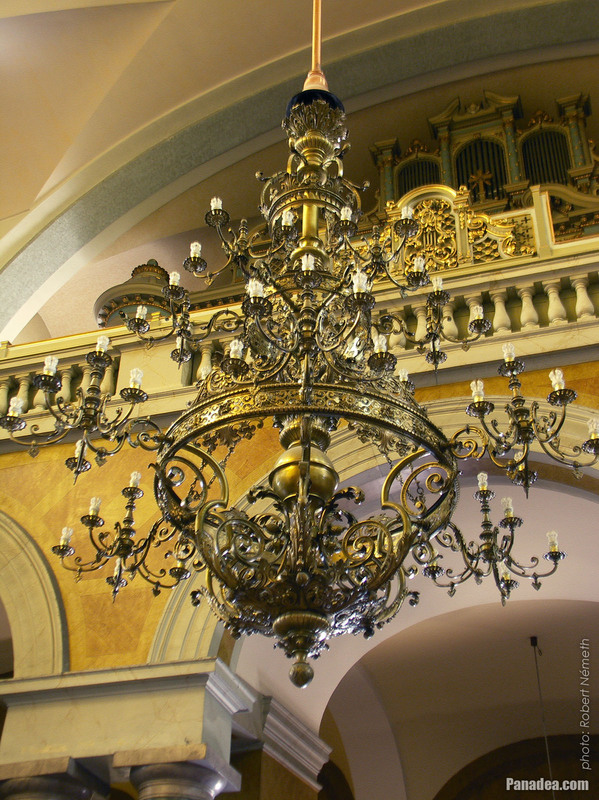 The previous main altar of the Inner City Parish Church was destroyed in the World War II. 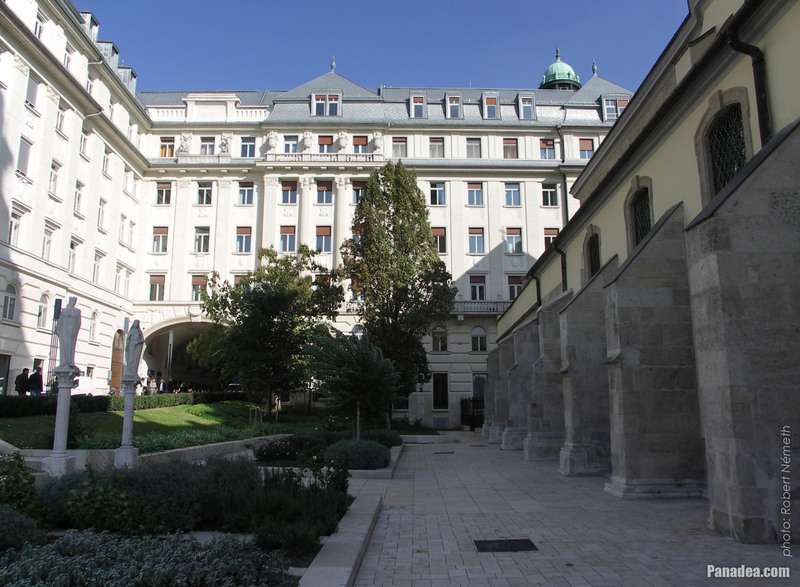 The currently visible painted triptych (winged altarpiece) was created by Pál Molnár C. in 1949. 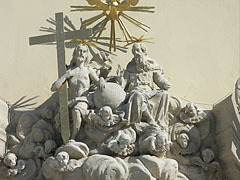 The white stone altar was created by Lajos Pap stonemason by the plans of János Sedlmayr in 2002. 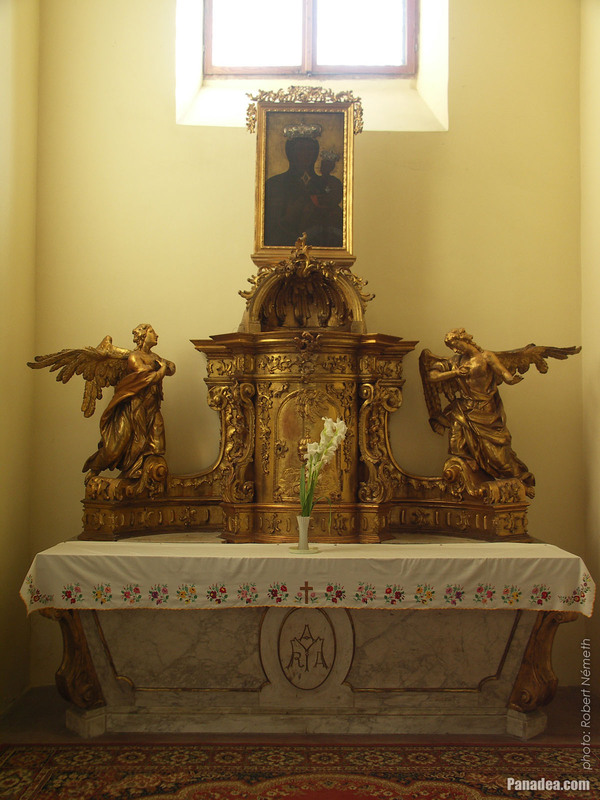 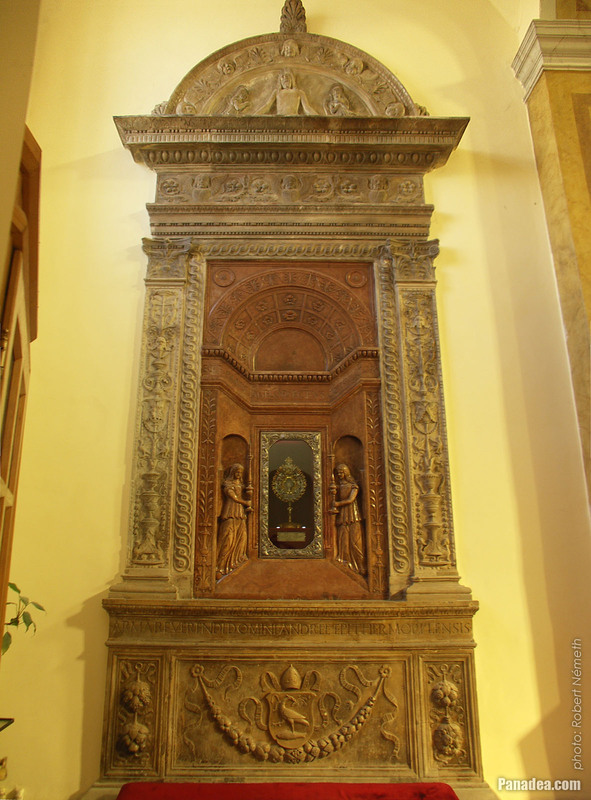 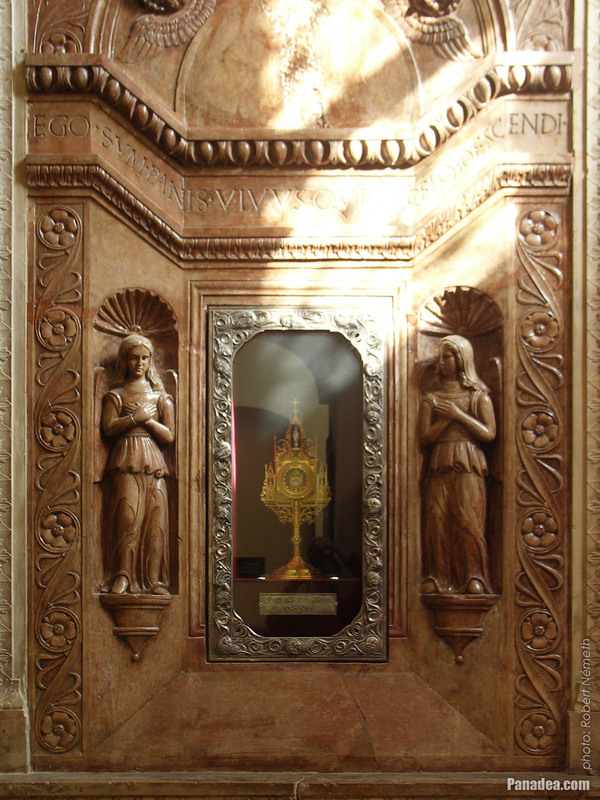 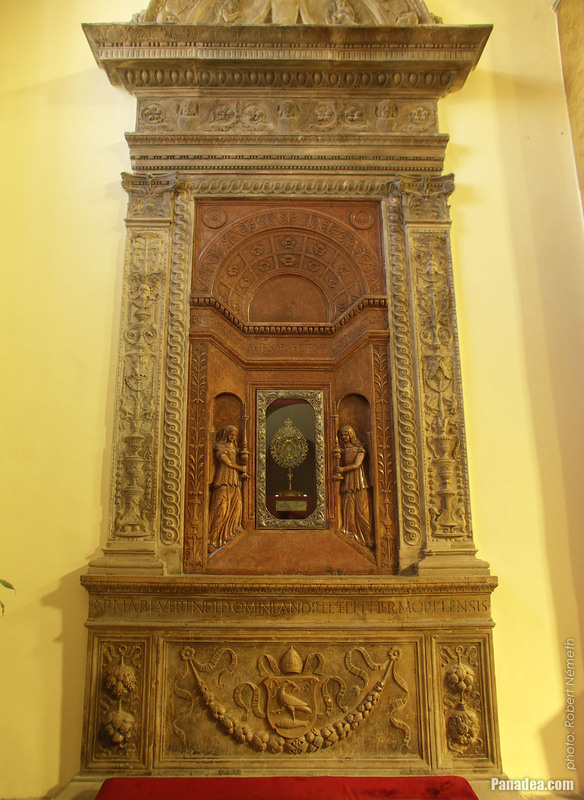 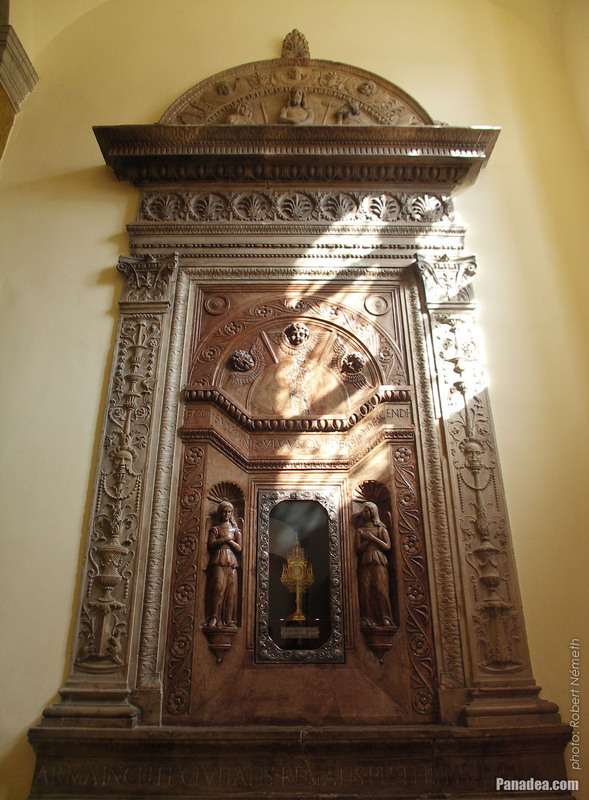 In the middle of it inside a small niche there is a relic of St. Gellért or St. Gerard Sagredo (980-1046) Italian Benedictine monk and martyr bishop. 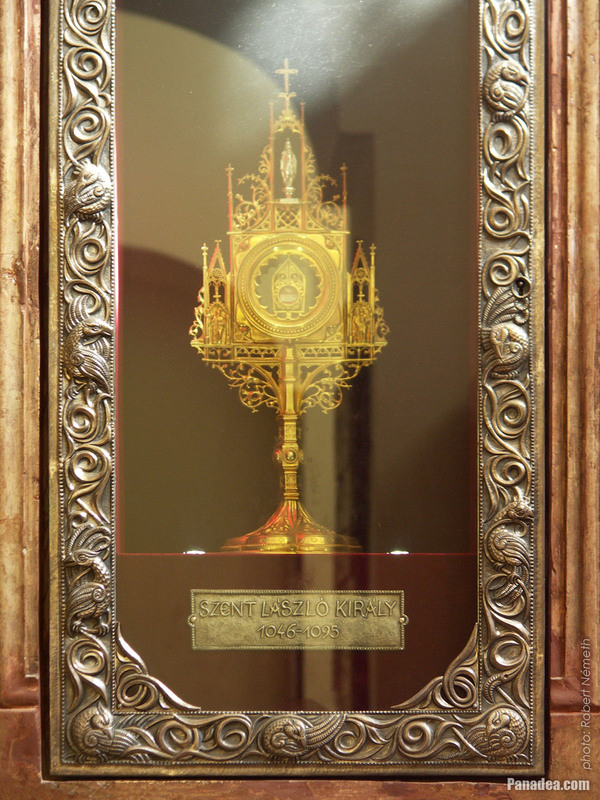 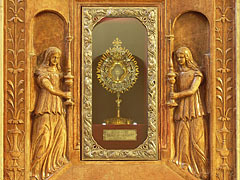 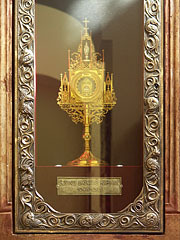 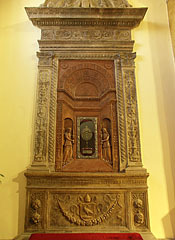 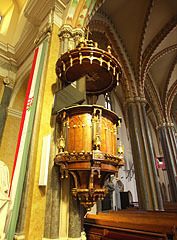 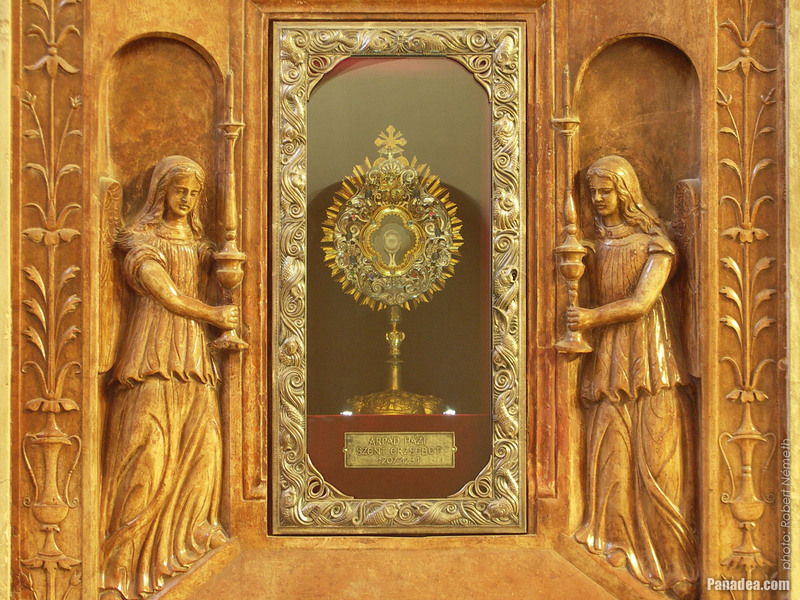 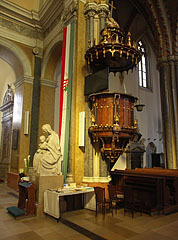 The complete relic of St. Gerard Sagredo is kept in Murano, Italy, this is a part of it and placed here in the Inner City Parish Church in 2002. 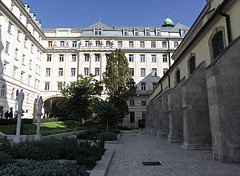 After bishop St. Gerard died he was coffined and buried on this place, in the predecessor building of the current church. 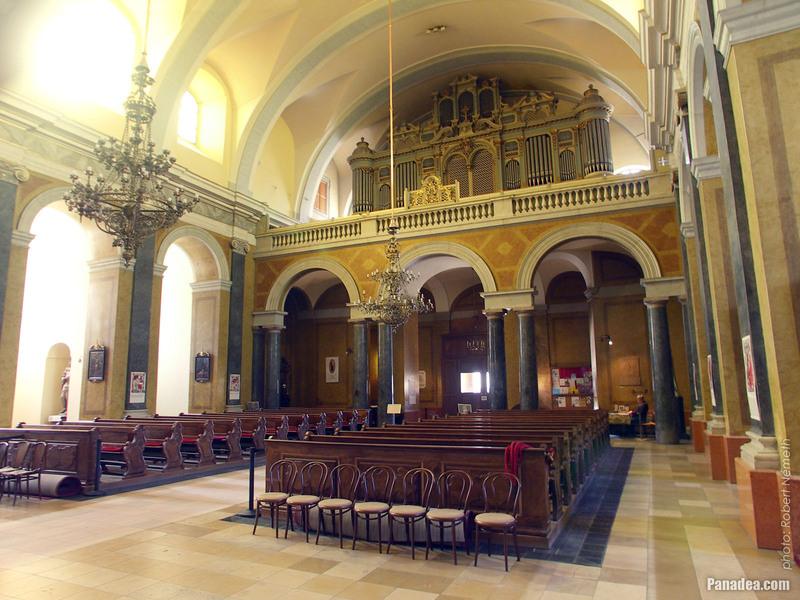 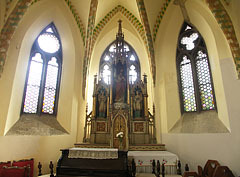 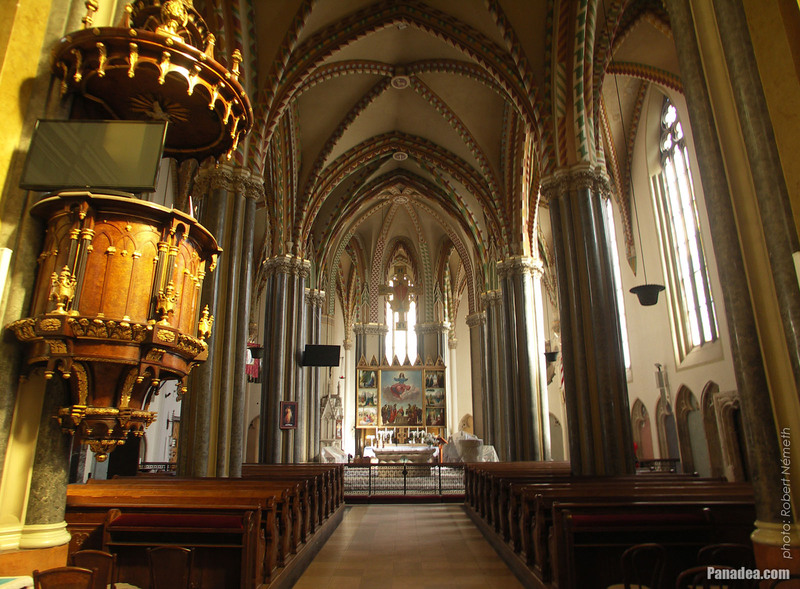 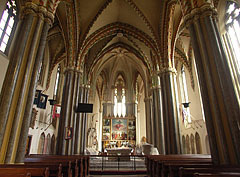 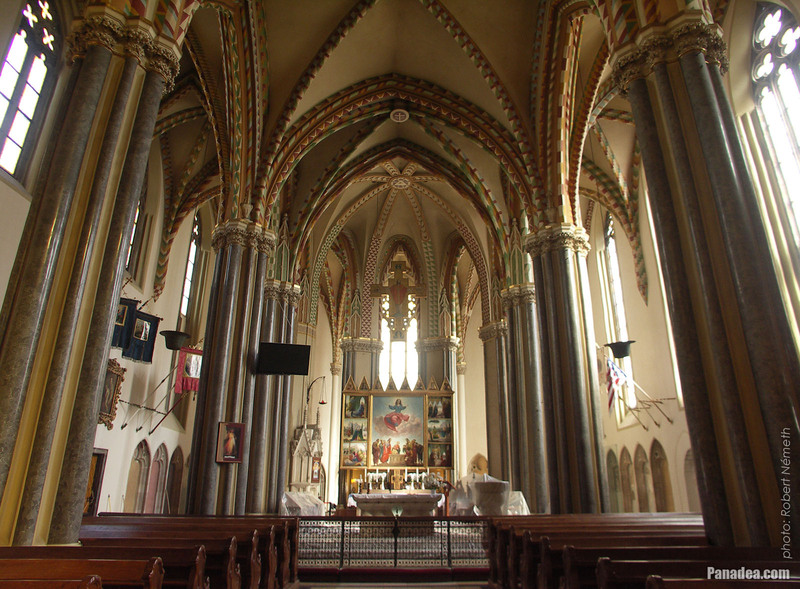 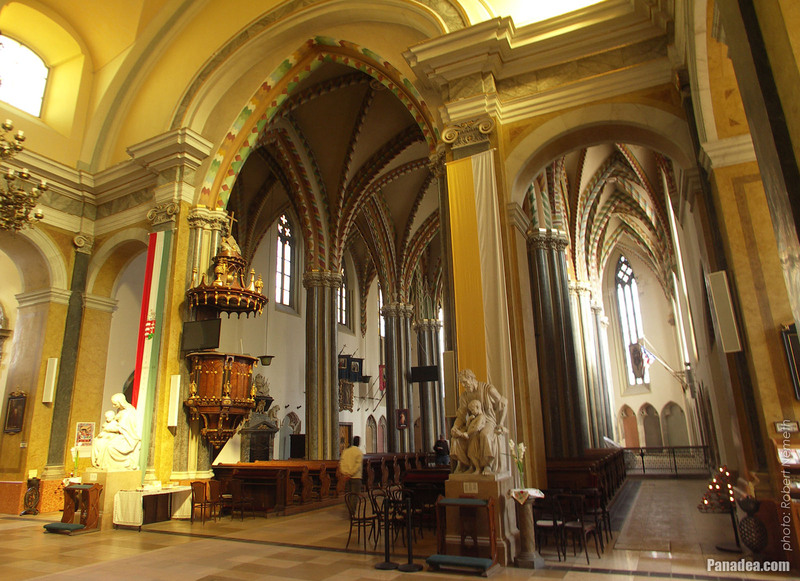 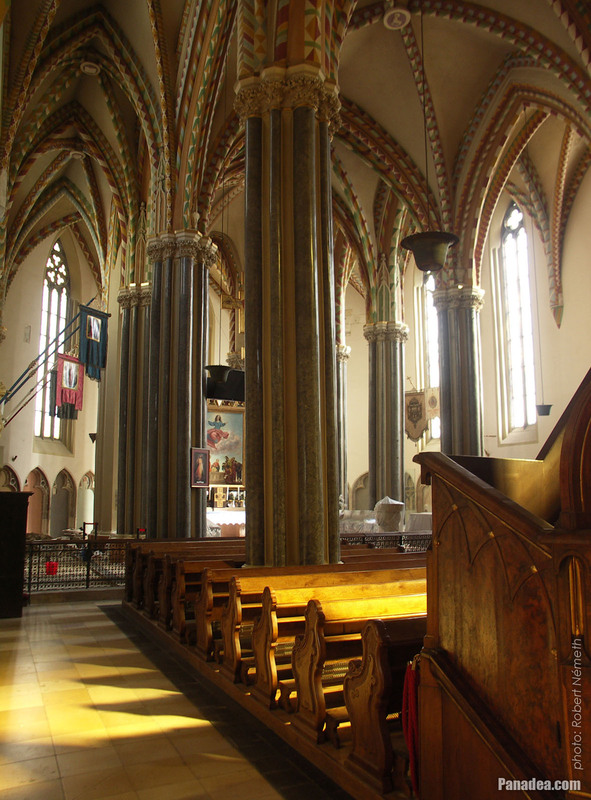 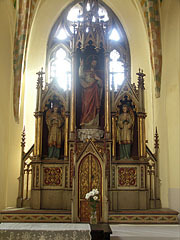 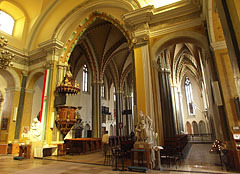 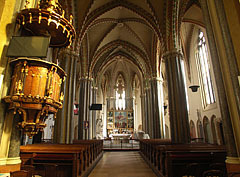 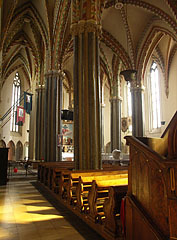 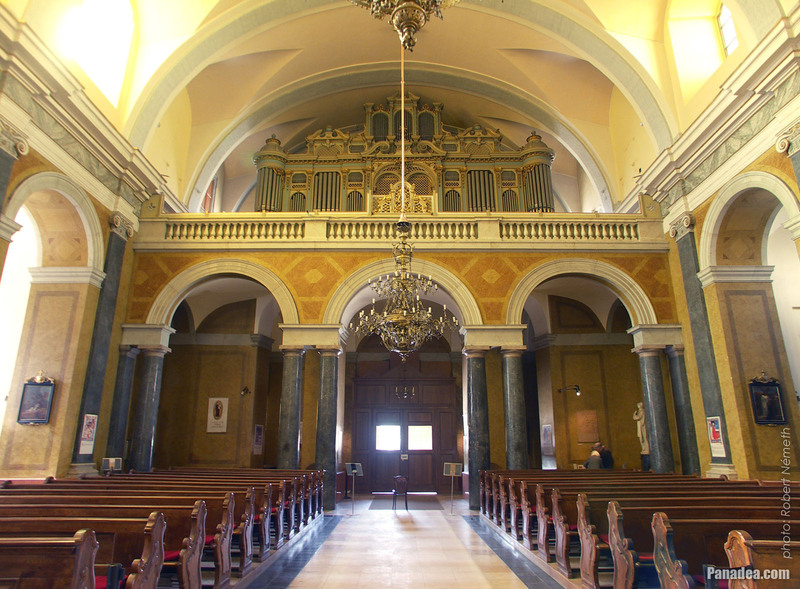 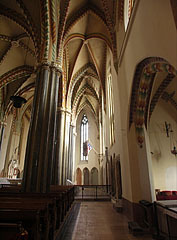 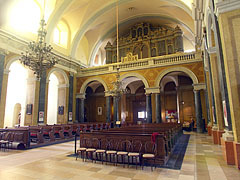 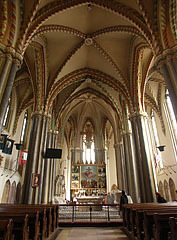 To the left from the main altar there is a gothic style church tabernacle (sanctuary box). 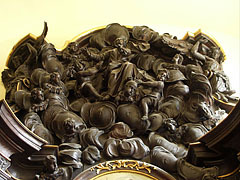 On its vitreous enamel picture there are symbols from the Book of Revelation (the Apocrypha): a lamb and the book with seven seals. 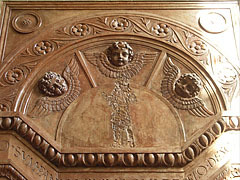 The church tabernacle was created by Edit Morelli in 2003. 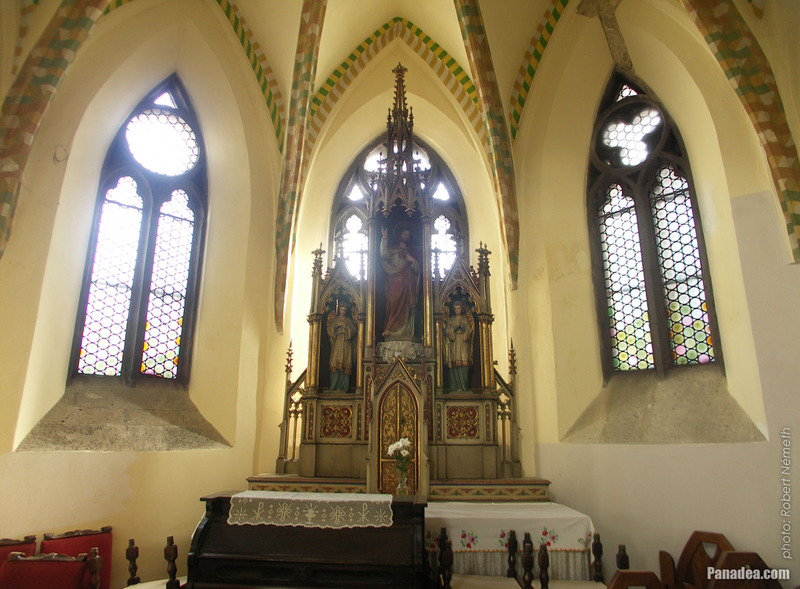 During the World War II in 1944, when one of the tower spires of the Inner City Parish Church was damaged, the colorful main altar, that was designed by Imre Steindl in 1889 and had rich Zsolnay majolica decorations was also destroyed. 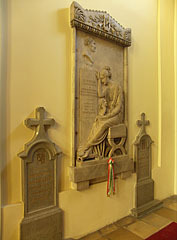 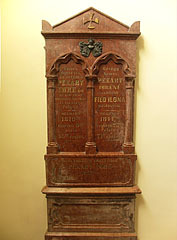 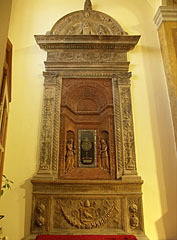 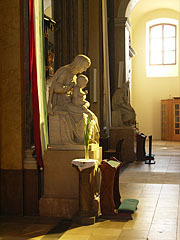 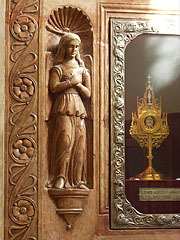 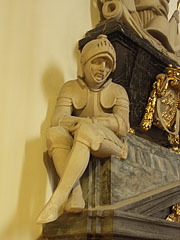 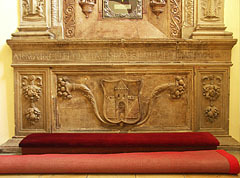 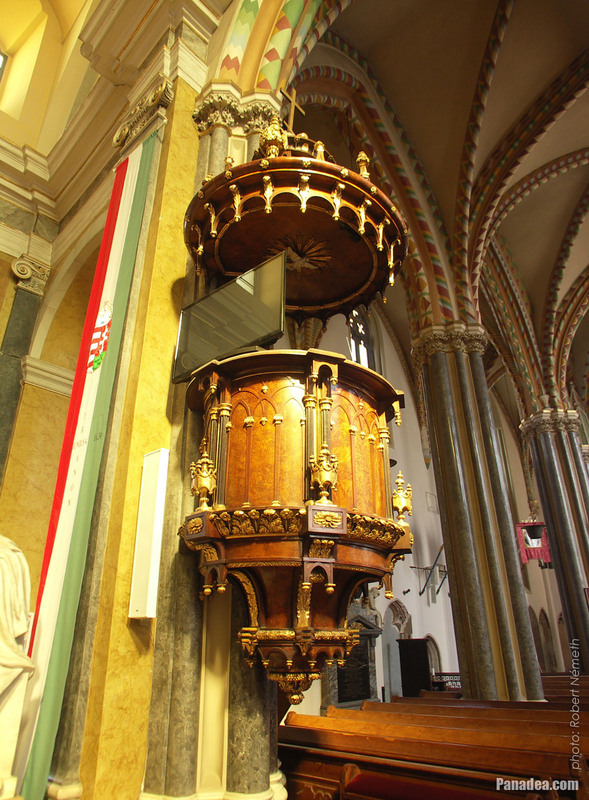 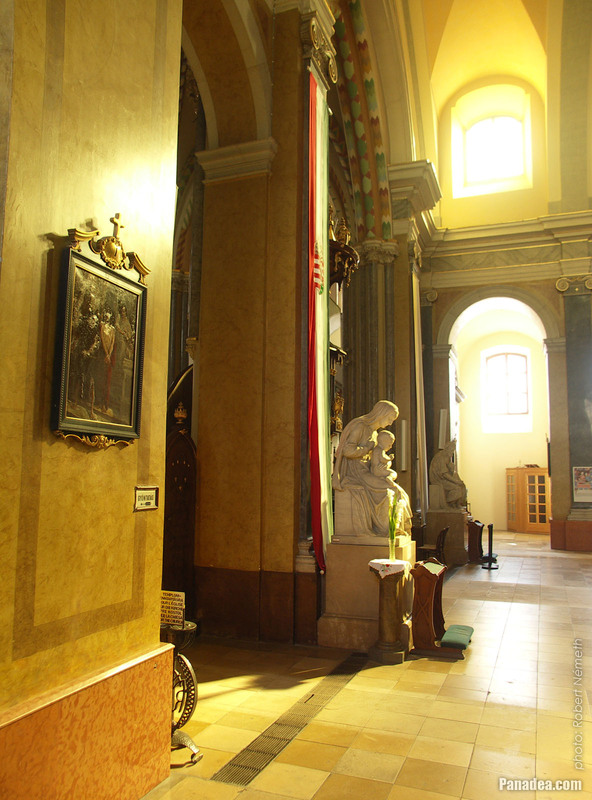 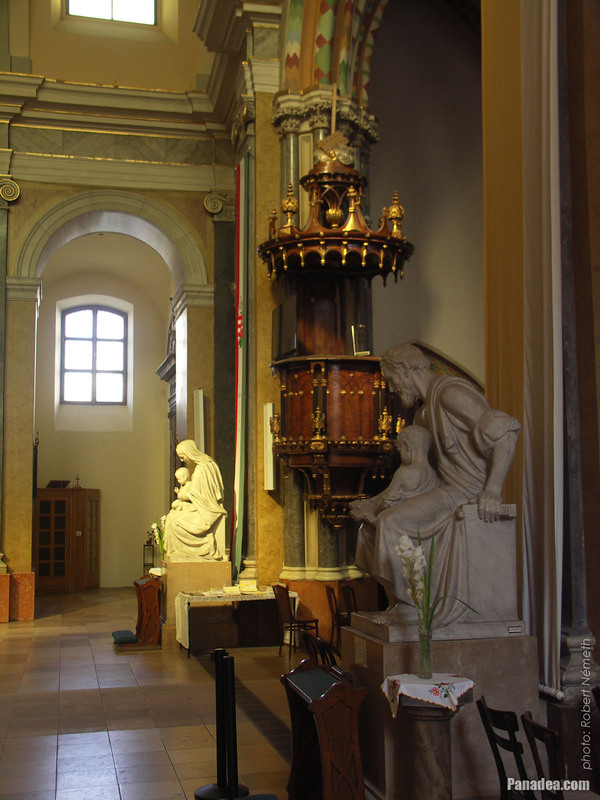 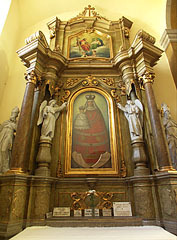 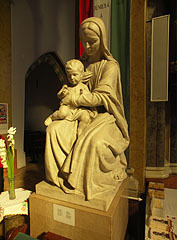 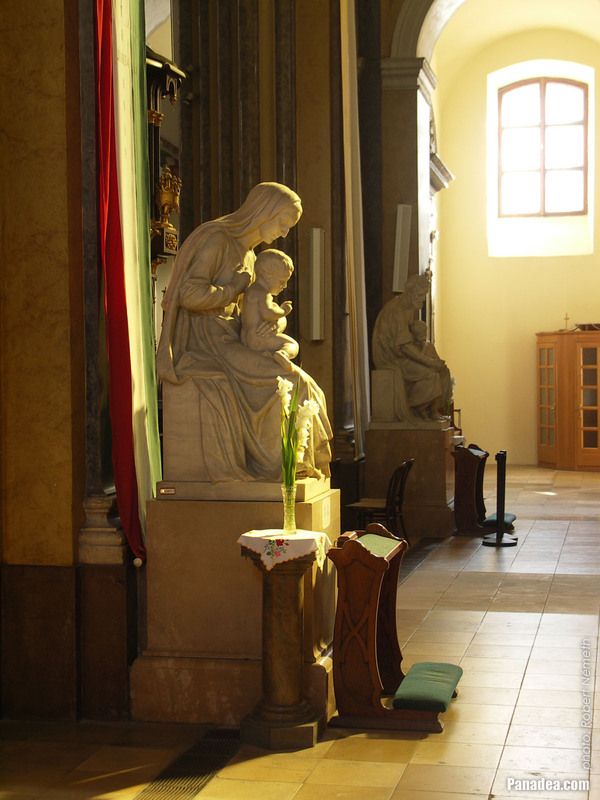 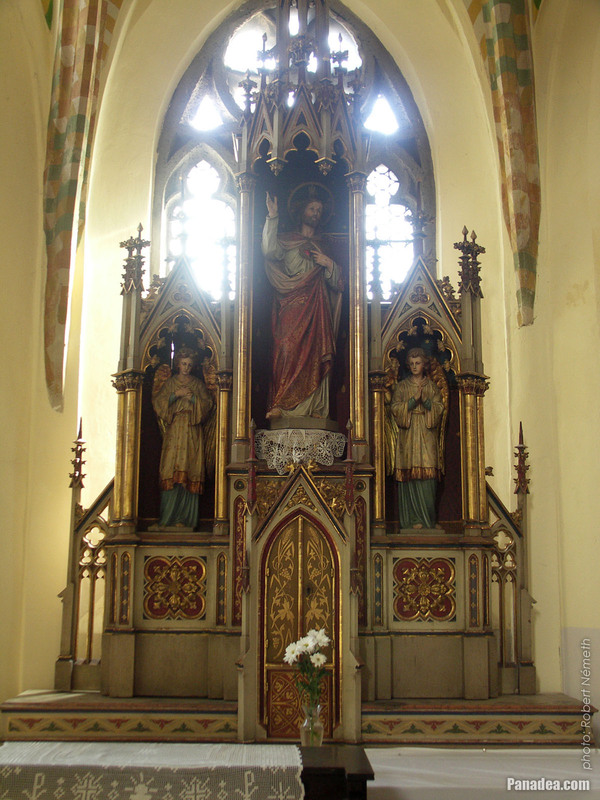 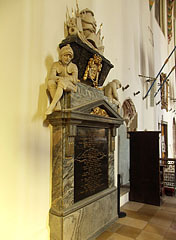 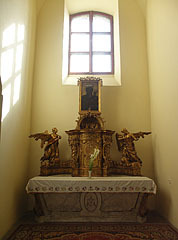 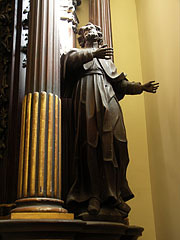 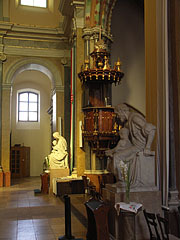 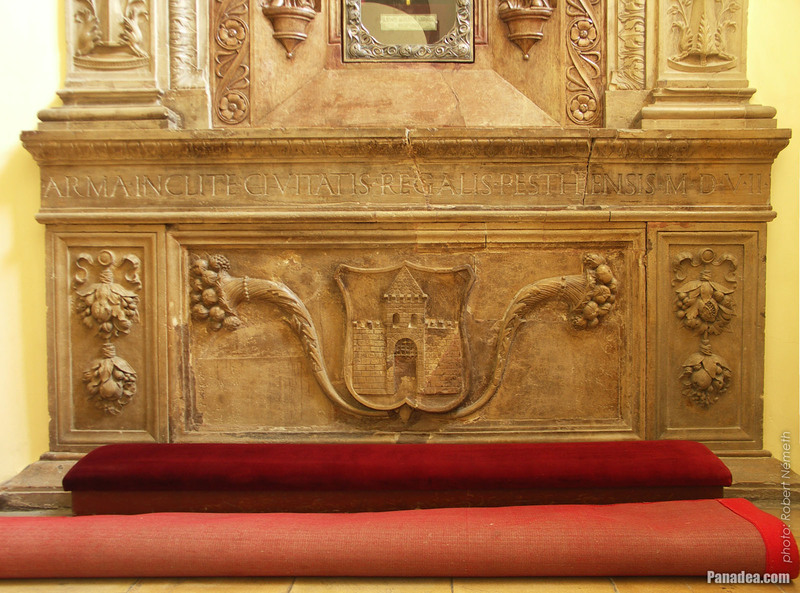 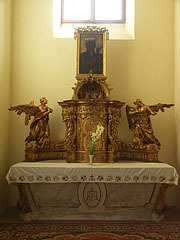 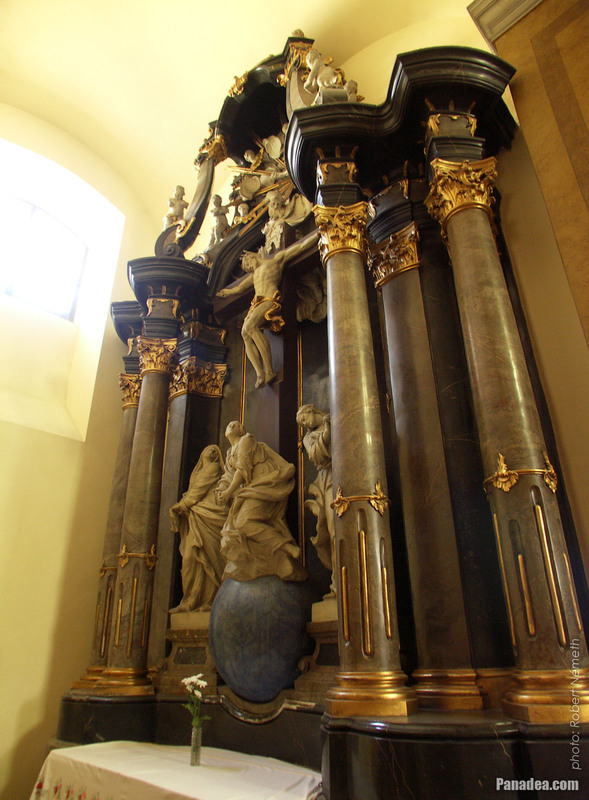 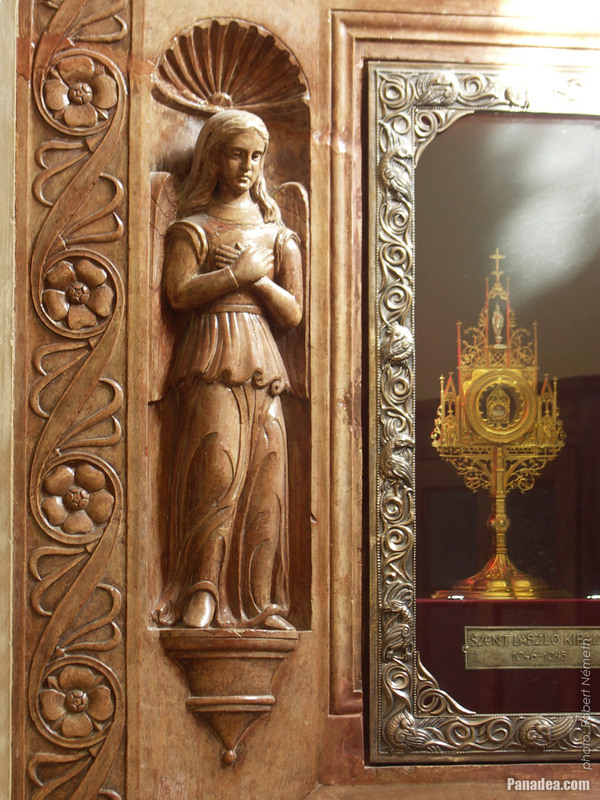 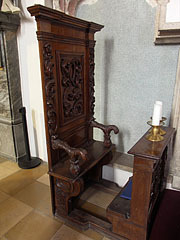 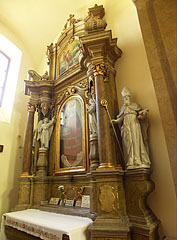 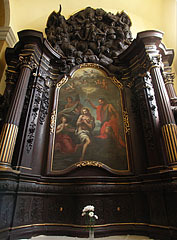 The present altar is designed by László Gerő, it was placed here during the reconstruction of the church. 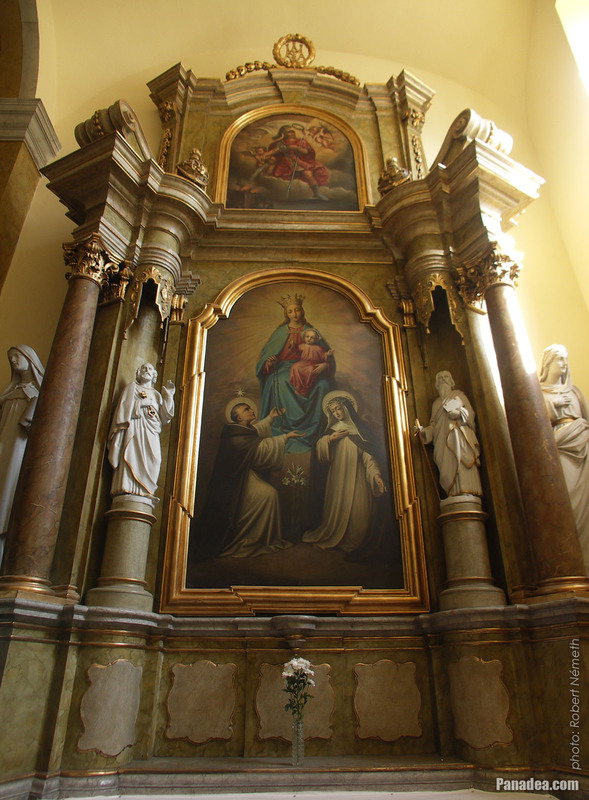 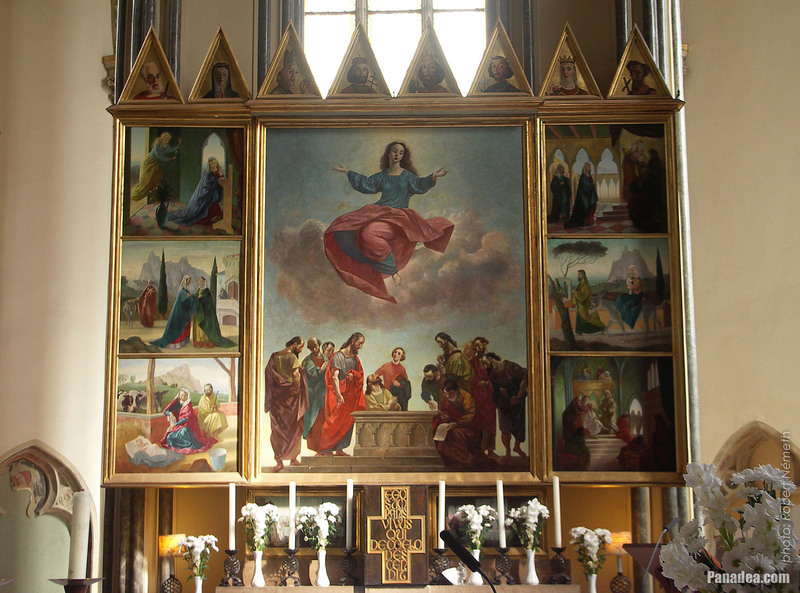 The altarpiece was painted by Pál Molnár C. in 1949, its central picture represents the Assumption of Mary to Heaven. 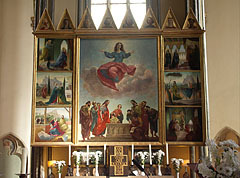 The smaller pictures shows scenes from the life of Jesus. 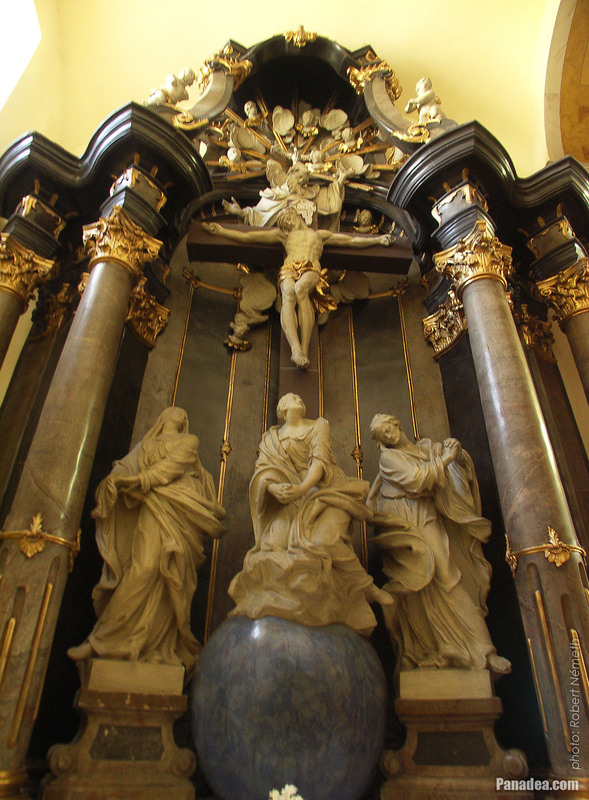 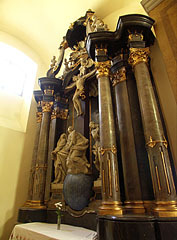 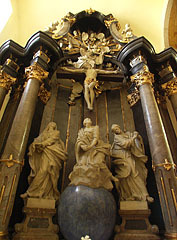 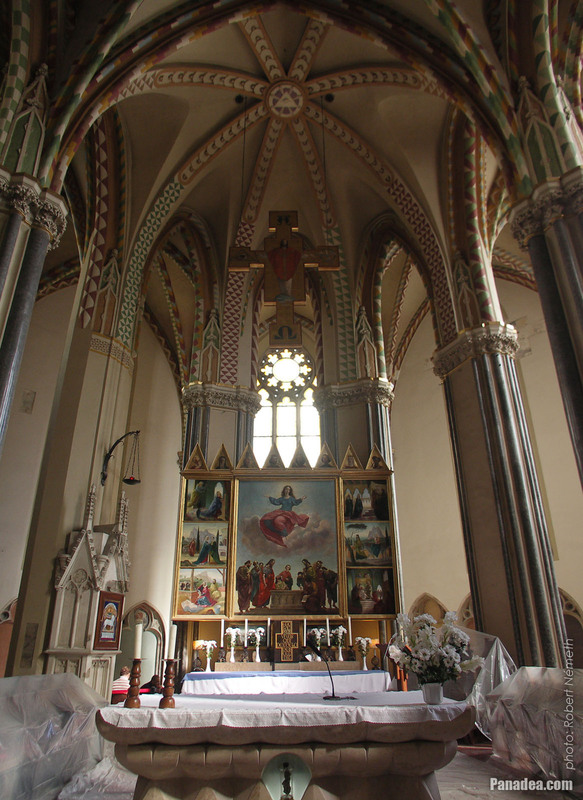 On the top of the altar there are portraits of eight Hungarian saints in small triangles, as well as when the winged altarpiece is closed the scenes of Christ's sufferings the Golgotha can be seen. 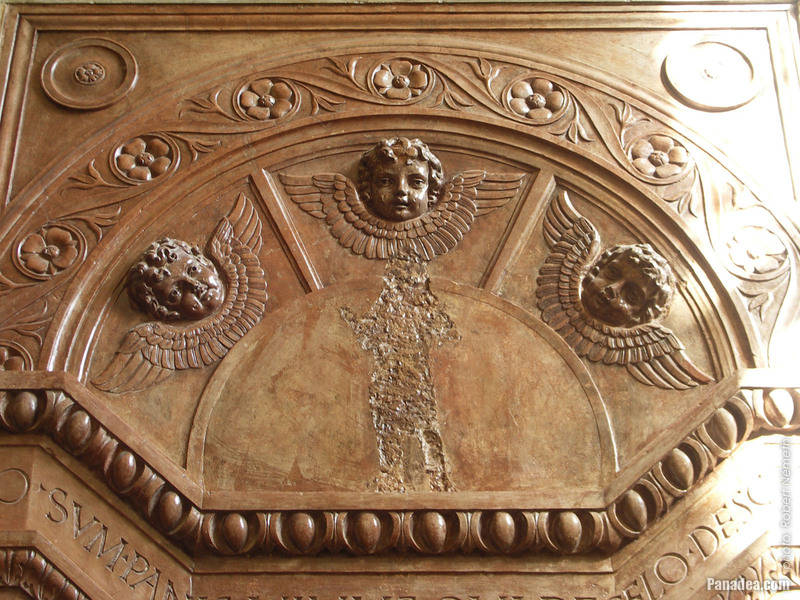 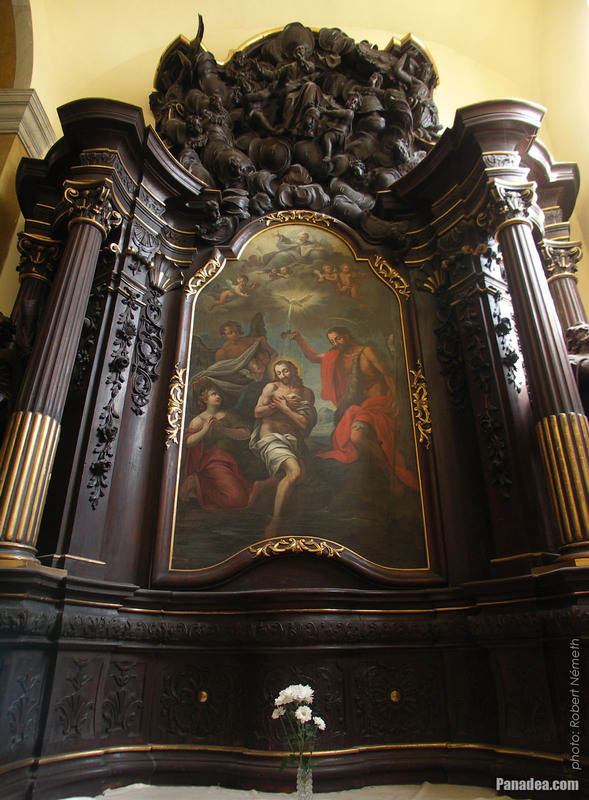 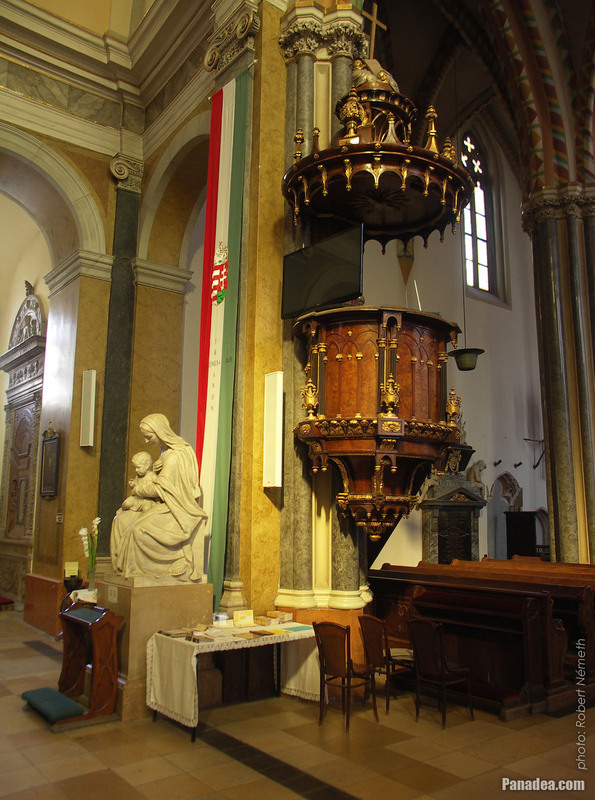 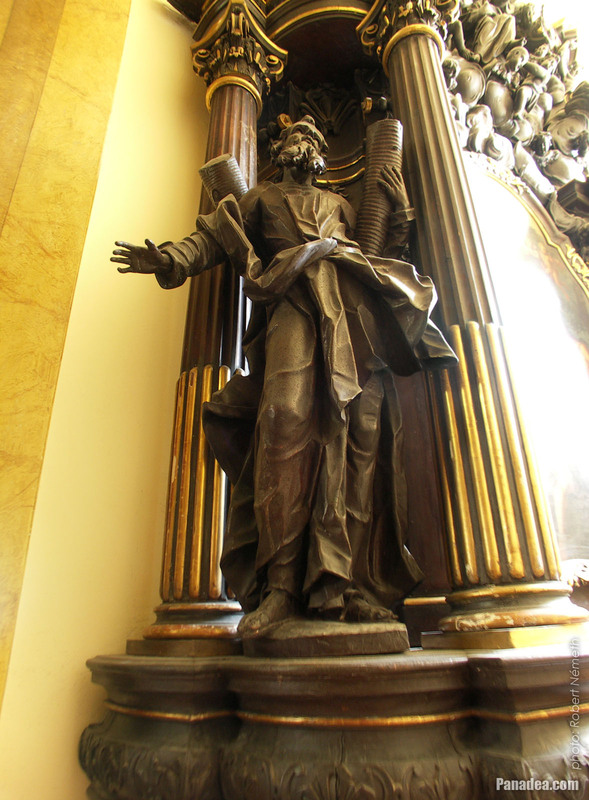 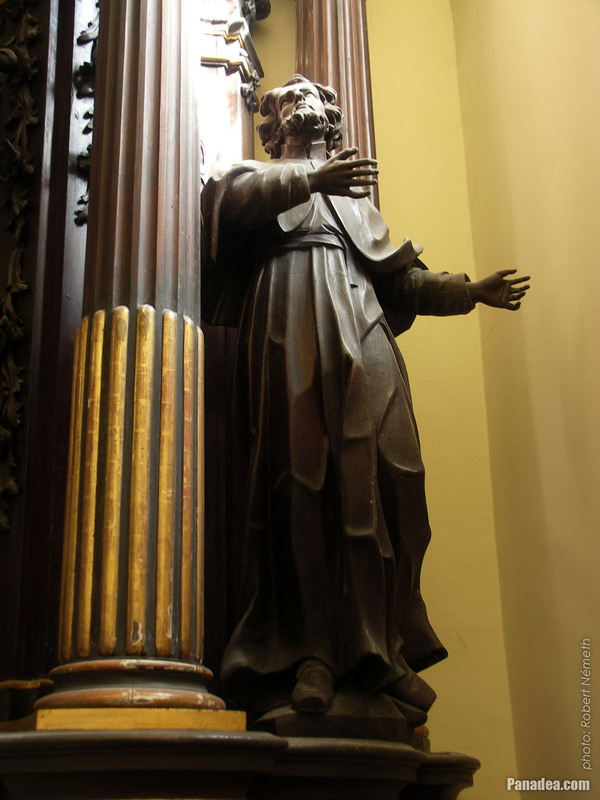 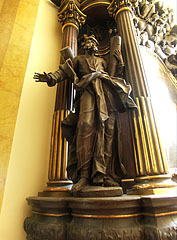 There is a very similar main altar in the Szent Lászó (St. Ladislaus) Parish Church in Angyalföld, in 13th district of Budapest, and this is not just by accident: that winged altarpiece is also created by Pál Molnár C.
The so-called "Pócsi" altar or Altar of Pócs in the Downtown Parish Church is actually a replica, the original one is in the St. Stephen's Cathedral (in German "Stephansdom") in Vienna. In addition, there is a third instance of this altar in Máriapócs, Hungary, at the Greek Catholic church and place of pilgrimage (the word "Pócs" in the altar's name is coming from the name of Máriapócs town). 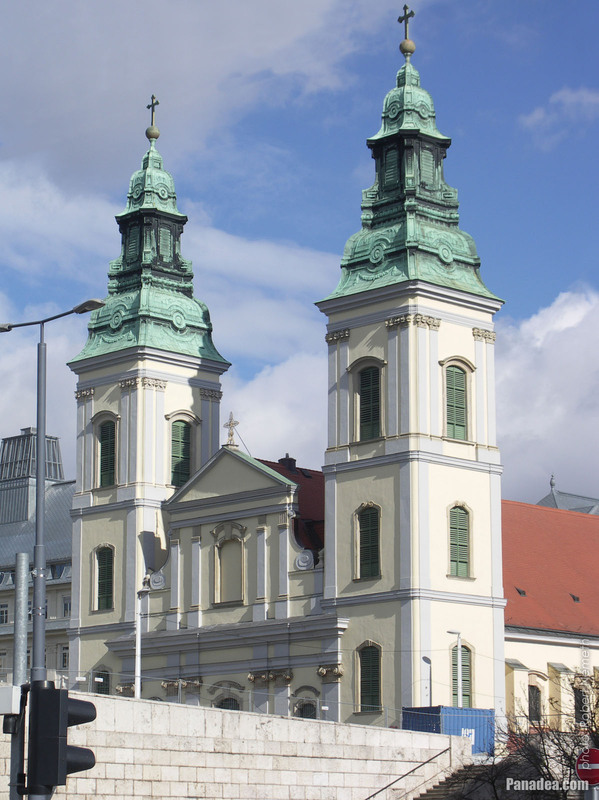 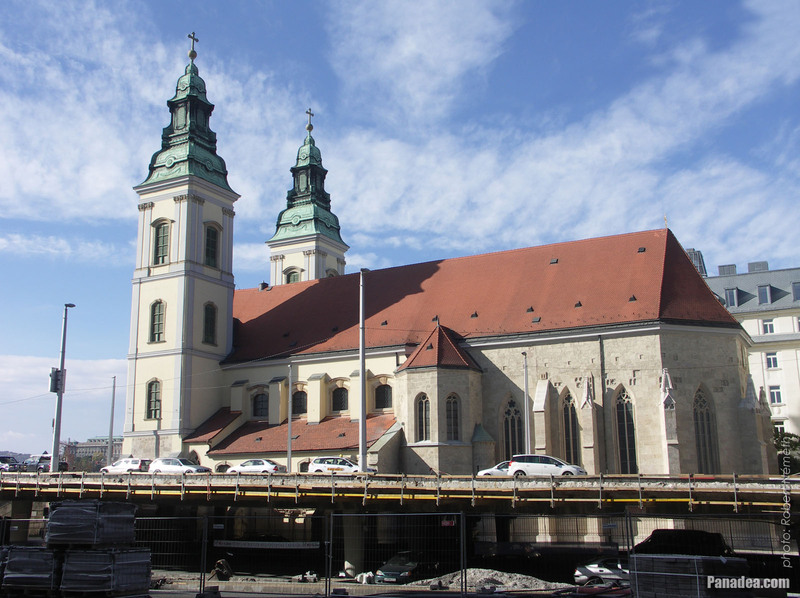 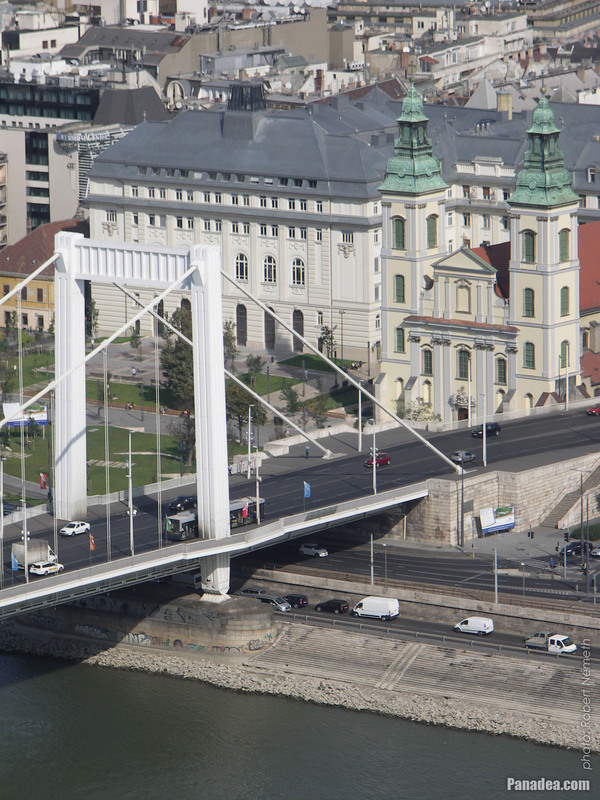 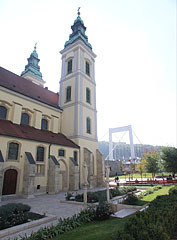 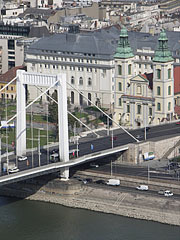 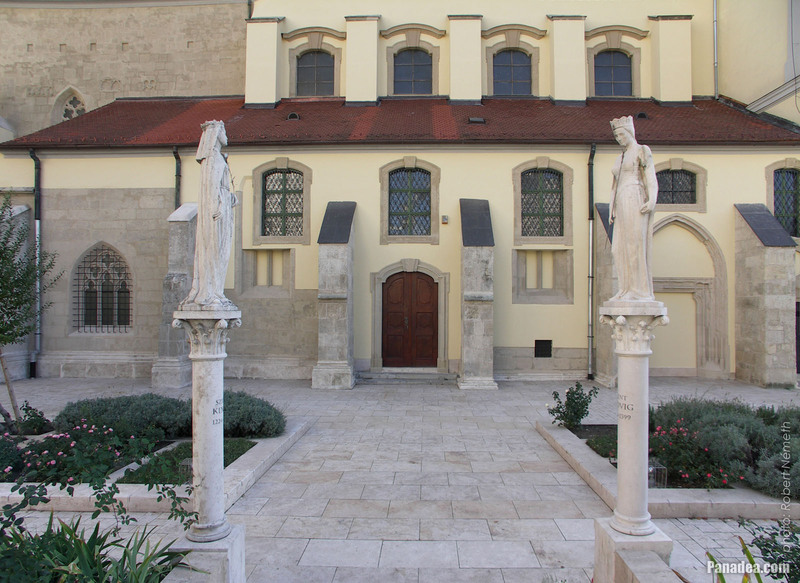 The Downtown or Inner City Parish Church is the oldest building of Pest, originally the church was built in romanesque style in the 12th century, partially on the walls of the former Contra Aquincum ancient Roman fortress. 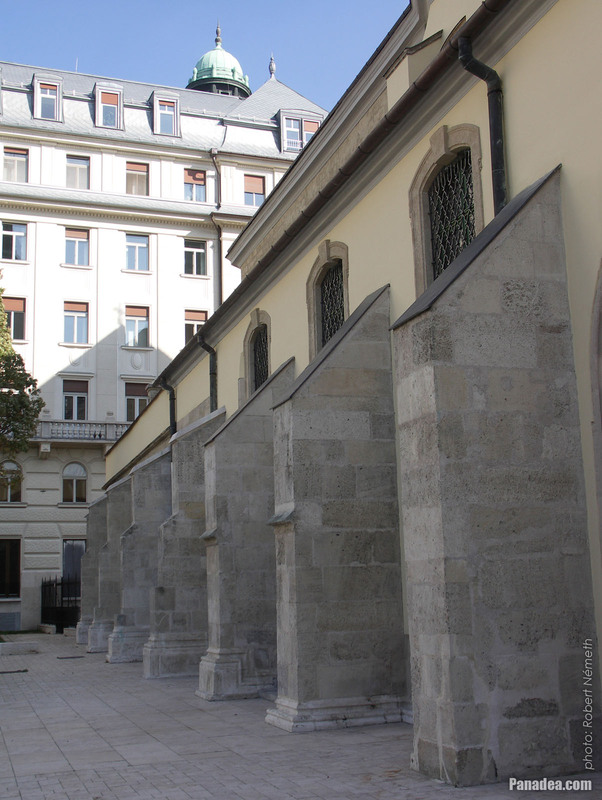 It was reborn at least two times, firstly in the 15th century in gothic style, but under the Turkish rule it became a mosque, then it was practically destroyed. 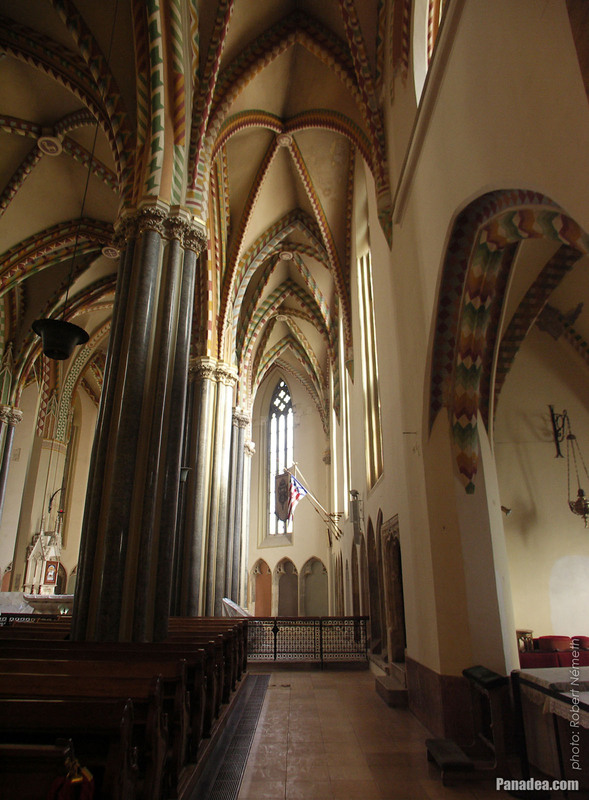 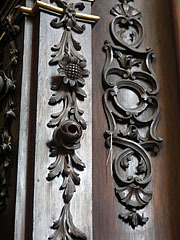 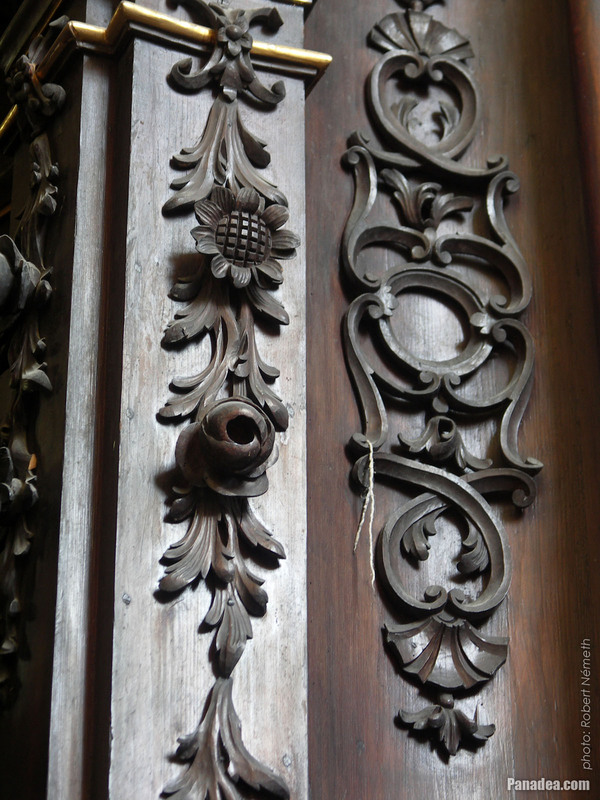 The gothic sanctuary and the sedilia (a kind of church seats) were survived. 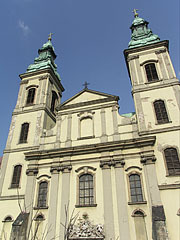 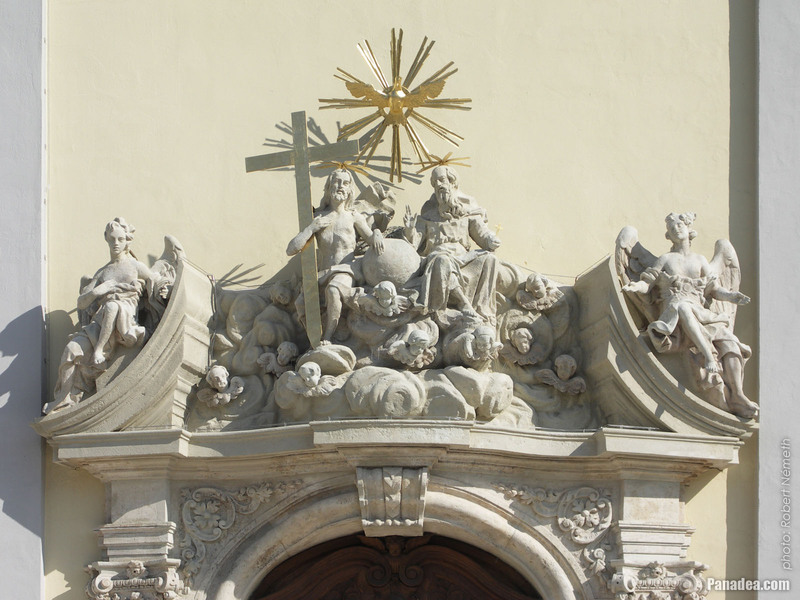 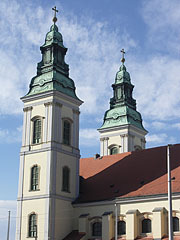 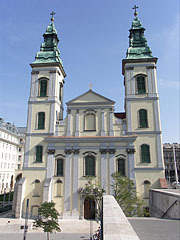 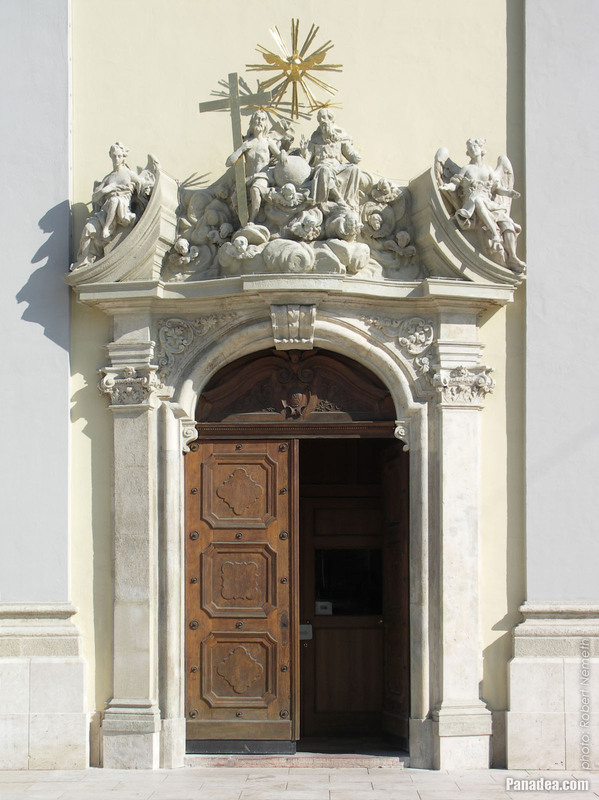 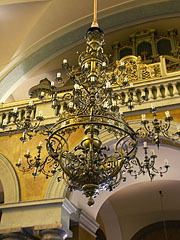 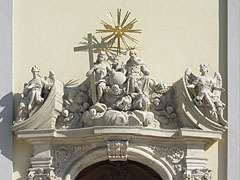 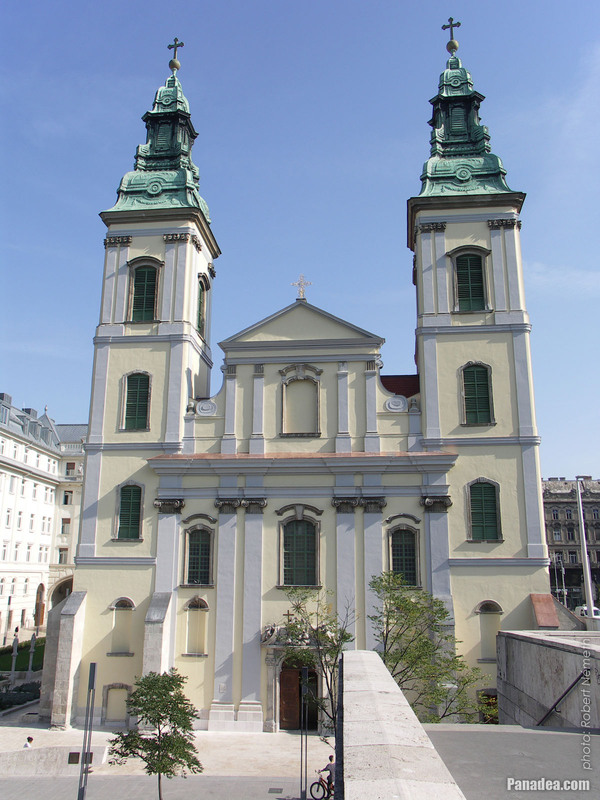 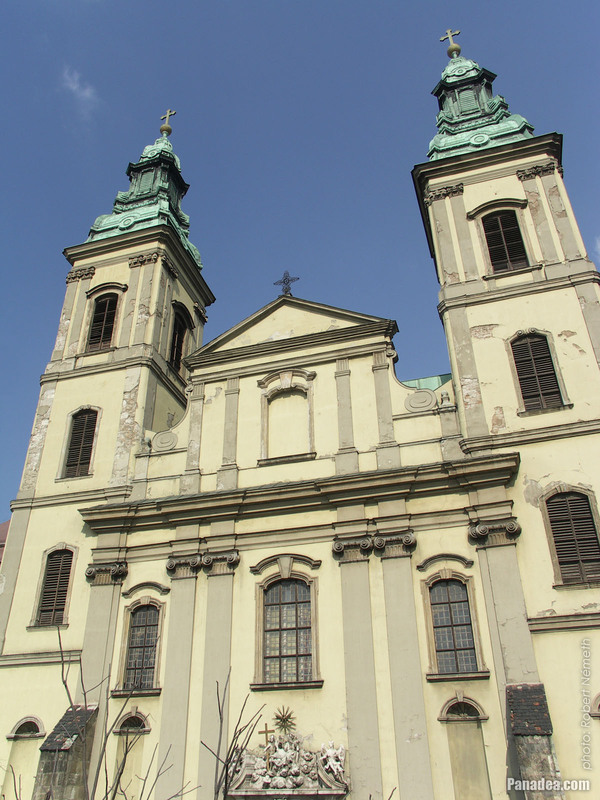 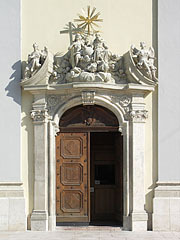 In the mid-18th century the church was rebuilt again, now in baroque style by the plans of György Paur.